Educators strive throughout their careers to steer students toward success, to praise those who are exceeding expectations and push them to new heights. But it’s just as important, if not more so, to give students who are struggling chances to succeed as well. Recognizing the particular importance of a strong academic foundation for students entering their sophomore year, Roseburg High School is offering a new summer school program this year meant to get struggling students on track to graduate. The school will be offering in-person classes to freshmen this summer in Algebra 1 and English 9, the two most commonly failed classes and the most difficult to recover. Coulson said these two classes were also selected because they are strong indicators of future success. The skills gained in these classes are foundational, in that they are used throughout the curriculum. If students can gain the skills that they missed in these classes, they are likely to be successful as sophomores and beyond. 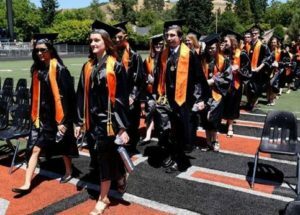 Roseburg High School graduates take the field. Focusing on this grade level is intended to address the skill and confidence-building that can help prevent “the avalanche,” or the three-year slide that can occur when sophomores don’t start the school year on track. Ensuring that Douglas County’s students graduate high school and are prepared to continue their education or enter the work field is the mission of Douglas County Partners for Student Success. DCPSS Director Gwen Soderberg-Chase said the new RHS summer school program is a progressive way to address a critical point in a student’s education. Coulson said that students who struggle as freshmen may begin to doubt their ability to succeed in school, and may give up when faced with the task of having to make up credits before and after school. The hope for this new summer program is that students will connect with a teacher, gain skills and start to rebuild confidence. Previous summer classes were offered using online platforms and were available only to upper-classmen. RHS expects the in-person format to give incoming sophomores the extra boost they need. “For many students who are struggling, in-person connections are very important,” Coulson said. The school hopes to reach up to 80 eligible students with the free class, which were scheduled from July 9 to Aug. 16.